My obsession with soccer began in 1990…while watching Italia 90. Since then I had become infatuated with anything soccer related. Soccer coverage was nothing like it is today…growing up in a small, midwestern town I had to work to find anything soccer related. I would scour the tv listings each week hoping ESPN would air anything soccer related. In the event that ESPN would air an episode of “German Soccer Weekly”, I’d have to frantically call friends, asking if they would tape the show for me as we lived in an area that was unserviceable by the cable companies. You can imagine how excited I was when I first learned about Eurosport. 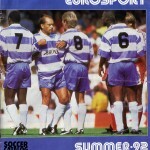 I received my first Europort catalog in the Summer of 92. I was hooked.